All pouches are hand made by Gazzo. Gazzo has been working in leather for 35 years. He was trained by an English saddle maker and has been making leather products for falconers, magicians, and bikers. 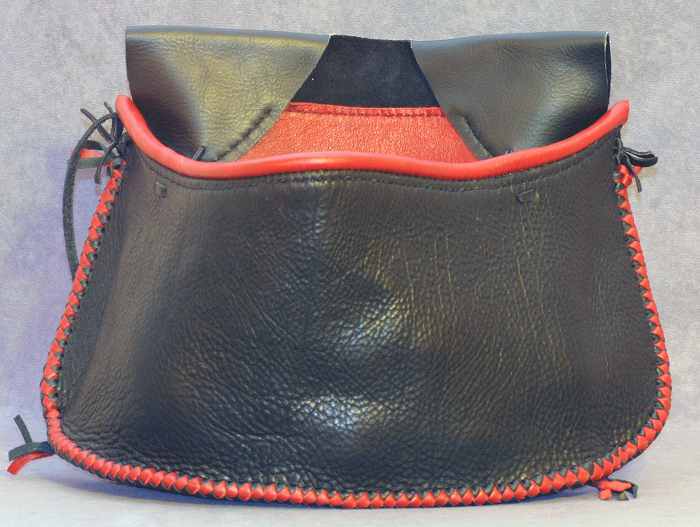 He uses the finest quality of leather and the pouches will last a life time! Unlaced Pouch: Also designed for Gazzo’s Cups and Balls routine with 6 large oranges and a large melon. Only difference is that this pouch does not contain the mexican round braid. Therefore cheaper in leather, labour and in price. Still a hand made pouch by Gazzo. Laced Pouch: A custom hand made pouch by Gazzo suitable for his routine which holds 6 large oranges and a large melon. It has mexican round braid around the edge. This is done with 4 different strands of high quality leather. Please note pouches may come in colours such as: red/black, black/black, brown black. PRIVATE LESSONS: For private one on one lessons or workshops please email gazzoshow@gmail.com for more information. To order a custom made leather pouch for Gazzo’s Cups and Balls routine, or any of his books and dvd please email Gazzo directly for information.